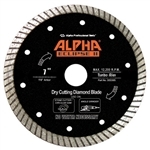 The Alpha® Vetro Blade is designed for high-speed wet cutting of glass. Mad Max Green Turbo Blade. Available sizes: 4", 4.5", 5" & 7". Mad Max Gold Turbo Blade in sizes 4.5", 5", 6" & 7" for dry & wet cutting marble, granite, engineered & other natural stone. Tile Installer's Choice for Chip-Free Wet Cutting for Granite, Marble, Porcelain, Engineered Stone, Travertine and Ceramic Tiles. Avaliable sizes: 4-3/8", 5", 7", 8" & 10". 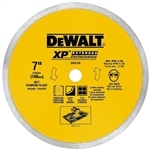 Dewalt DW4766 7 Inch Premium Porcelain Tile Blade features an extended performance diamond matrix that provides long life and enhanced material cutting. The BEAST Porcelain Tile Blades are designed to cut porcelain, marble, granite, and ceramic tiles. Available in 5", 7", 10" diameters. Mad Max J-Slot Porcelain Blade. Available sizes: 4", 4.5", 5", 7" & 10". Mad Max Supreme Atlas Turbo Blade - New & Improved! The Mad Max Supreme Atlas Blades a formulated with a special softer bond that results in super fast cutting. Available sizes: 4", 4.5", 5" & 7". Mad Max Thin Rim Porcelain Turbo BladeS ARE specifically designed to handle very hard stone and porcelain. Available sizes: 4.5", 5" & 7". The Pearl P4 Turbo Mesh Porcelain Tile Blade features a Turbo-mesh rim that virtually eliminates heat caused by friction. It is designed to be used on porcelain, granite, hard tile and other natural stone. Available in 4", 4.5", 5", 7", and 10" diameters. Mad Max Turbo Mesh Porcelain Blades are ideal for cutting hard porcelains and stone tiles. Sale price good through 4/30.